Just acquired this tractor in a land deal. Very excited to get it running and restore it. Its been well used with over 3000 hours. It has some surface rust but not too much structural. Spent the last few weeks installing a new carb, rebuilding the starter, testing the generator and realizing i have a bad coil, which is on order. The gas tank was filled with old gas, varnish and rust. After multiple treatments got most of the rust out and now reinstalling with new sediment tank. In the meantime knocking off the rust with a steel brush and trying to get the oil plug off so i can change the oil. THe square nut seems to be rounded and tapered and very difficult to get a wrench to grip. Could us some help here. Was very glad to read about the transmission drain plug cotter pin situation. I hit it yesterday and it drained a couple ounces of fluid, very watery. I thought I had a issue that had been jerry rigged. glad to see it was part of the design. Hope to find some folks that have been through this process before, particularly on this model tractor. Thanks in advance for any help. I am a newbie so be tender. Bfonda welcome to YT and congratulations on your Jubilee! To remove the plug, first order a new plug from this site. It will come with a new screen and gasket. Order two spare gaskets with it. To get the drain plug out, place your hydraulic bottle jack under it with a block under if needed, and a 2x block on top of the jack. Put your 16 inch pipe wrench on the plug with the jaw adjusted so that it is nearly holding itself there. Jack the block up to the pipe wrench so that a good portion of the Jube's weight is now on the jack. Put a four foot pipe on your pipe wrench handle and turn the plug 1/8 turn. Get your drain pan and remove the jack, then remove the plug. The best weapon for removing rust from sheet metal is a twisted wire cup style brush in your 4.5 inch grinder. for the cast iron and structural steel a #80 flap wheel works a lot faster. Your Jube appears to have some pitting to the rust, so you will need to use one of the many phosphoric acid products to get down into the pits and convert the residual rust to iron phosphate. Iron phosphate is the black protective coating that you see on some nuts and bolts and on impact wrench sockets. Have fun. Lots of good info on the Ford forum here at YT. Have fun with your new toy. Showcrop- Thanks for the great advice. you saved me alot of headache. bfonda ,Follow Showcrops advice on the oil drain plug removal.You did right when you rebuilt the starer,rather than replacing it with new aftermarket junk.You should have done the same with the carburetor,save the original Marvel Shrebler caeb and have it rebuilt for later and you will need it someday. Royse over on the N Ford board rebuilds carburetors and then tests them before sending them back to you,and he does GREAT work.Rebuild all your parts that you need,rather than replacing tjem.Welcome here and good luck with your new tractor adventure. (quoted from post at 07:49:00 01/07/19) bfonda ,Follow Showcrops advice on the oil drain plug removal.You did right when you rebuilt the starer,rather than replacing it with new aftermarket junk.You should have done the same with the carburetor,save the original Marvel Shrebler caeb and have it rebuilt for later and you will need it someday. 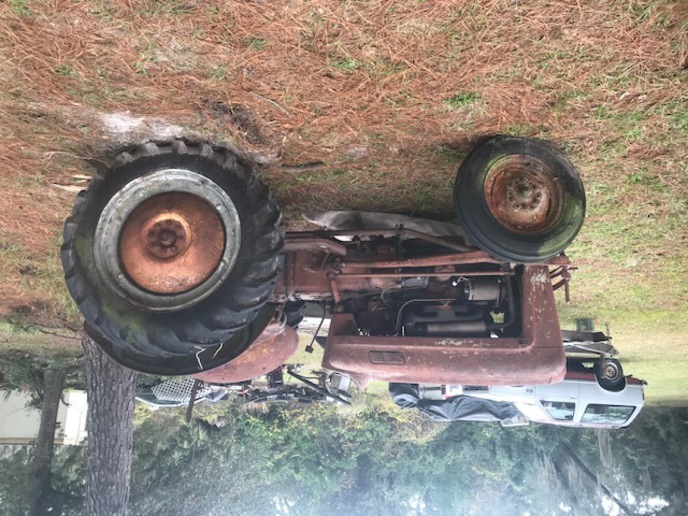 Royse over on the N Ford board rebuilds carburetors and then tests them before sending them back to you,and he does GREAT work.Rebuild all your parts that you need,rather than replacing tjem.Welcome here and good luck with your new tractor adventure. Interesting comment about the Carb. Would you believe after I ordered and installed that aftermarket carb, I found the original hidden in the garage. I am going to rebuild and replace once I get it running. The last piece that is missing is the oil filled air filter. I will look up Royce. Thanks for the good info.